Acupuncture involves the insertion of extremely thin needles through your skin at strategic points on your body. Our chiropractors (Dr. Alim Kara & Dr. Shereen Kangarloo) and physiotherapist (Geoff Gerber) apply different acupuncture techniques based on the needs of the patient. Traditional Chinese Medicine (TCM), acupuncture is most commonly used to treat pain. TCM explains acupuncture as a technique for balancing the flow of energy or life force (qi or chi) believed to flow through meridians (pathways) in your body. By inserting needles into specific points along these meridians, acupuncture practitioners aim to stimulate the flow of qi to treat pain and various other conditions. 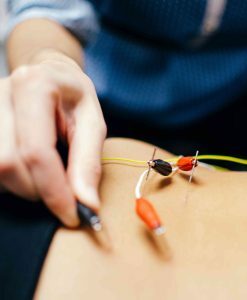 Often combined with electrical-stimulation (aka electrical acupuncture), this approach can be quite effective in treating acute-pain, muscle spasms and helping to activate/stimulate muscles that are firing incorrectly.